A Cup of Tea, Arabic-style | "Il faut goûter"
As a worker in my university’s International Student Affairs office during my college years and as a recent ESL teacher, I have made quite a few friends from Saudi Arabia. Many of them have been kind enough to invite me, with the utmost enthusiasm and hospitality, into their homes to treat me to authentic meals from their home country. Various ‘kabsa,’ their traditional dish of seasoned rice and meat, have been on the menu, along with Saudi dates, the most delicious of which are like heavenly morsels of caramel. It has been quite the treat each time. However, my favorite part of visits with my Saudi friends occurs quickly after they open their front door. They always usher me in, I kick off my shoes, and they tell me in their charming accents to “have a seat,” which I dutifully do, on their royal red floor cushions. They then produce two carafes, bejeweled in red and gold, and a tray filled with whatever sweets they’ve made or purchased. One pitcher is filled with cardamom-infused Arabic coffee, the other, mint-infused Arabic tea. I won’t elaborate on the coffee here, but search it out and definitely try it if you have the opportunity—it’s an interesting flavor and not at all like American or European coffees. But I do want to discuss the tea. This is a piping hot and strong cup of black tea, sweet nearly to the point of syrup-y, but deliciously fresh and herbal with mint. I don’t usually drink my tea sweetened, but this is one that I really enjoy as a sweet treat. I’ve had this tea at the homes of every Saudi person I’ve visited in my town, and I knew it must be simple to make, so I finally watched a friend prepare it last week and detailed the process in my food journal. My friend Ohoud told me that the secret is in boiling the tea and not just letting it steep. Also, it’s summer now, so try it iced—utterly refreshing! Pour water and sugar into a teapot or saucepan to boil on the stove. Heat on high until water is boiling and sugar has dissolved. 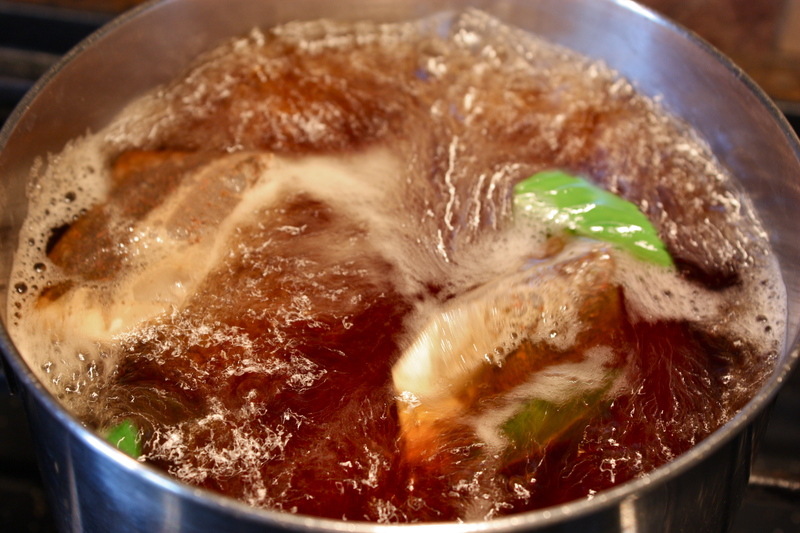 While water is boiling, add the tea bags and mint leaves and boil rapidly for 3 minutes. Turn off the heat and remove the tea bags and mint. *** The tea is now ready to serve! Enjoy!! 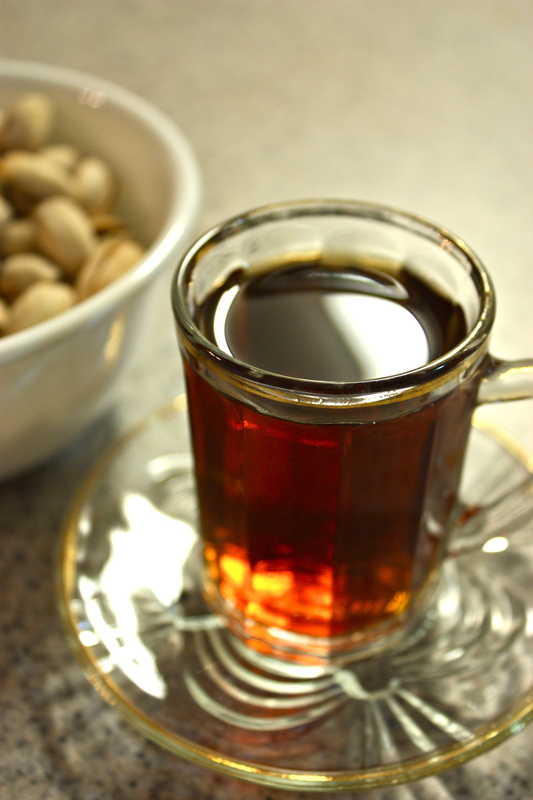 *1/4 cup of sugar achieves the sweetness at which my Saudi friends serve this tea. It’s quite sweet though, so you’ll have to adjust the sugar to your taste! **I made this tea using Lipton tea bags. My Arabic friends use black tea bags from their local Arabic grocery store. The tea was delicious with the Lipton too, though! 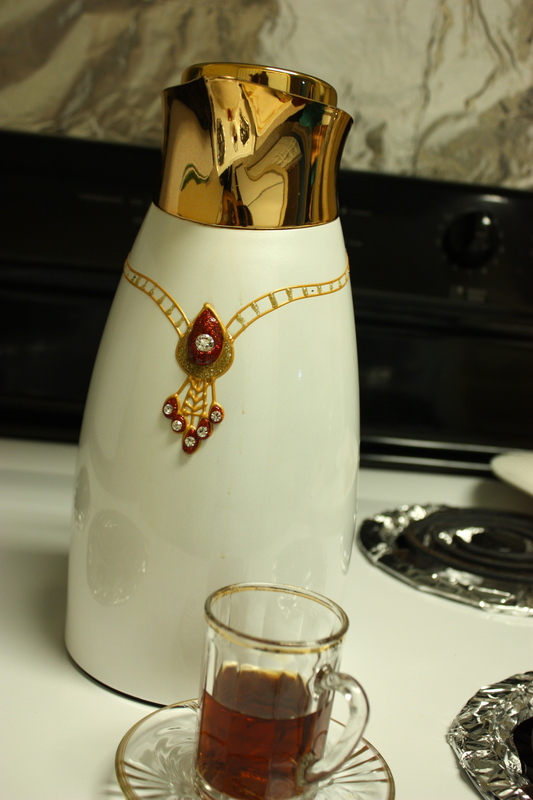 This entry was posted in Uncategorized and tagged arabic, arabic mint tea, mint, tea by needtotaste. Bookmark the permalink. I tried the tea and it is WONDERFUL. I love the mint flavor and I sometimes add lemon. Too funny, this is how I make my tea in the summer since I have so much mint. We stopped adding sugar, so it’s not truly Southern but we do it Southern style. What size tea bags are these, family size or single serving size? Cheers.